You can find your prescription with the paperwork given to you at your eye exam visit, on your contact lens box or on the blister packs that hold your contact lenses. A typical prescription includes the following: base curve, diameter, power (or sphere), and then additional figures for Cylinder and Axis if you have an astigmatism, and Addition and Dominant figures for presbyopia correction. Your left and right eye prescription will usually be listed separately. On your prescription you will often find the name of your contact lens e.g. Acuvue Oasys, and an expiration date. 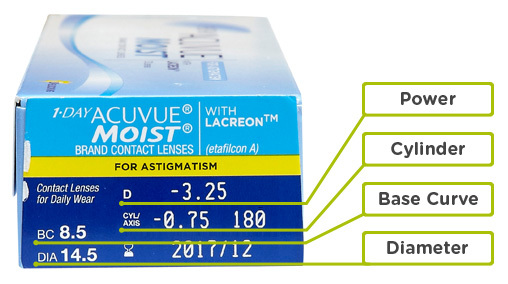 Here is an example of a the prescription listed on the side of a 1 Day Acuvue Moist for Astigmatism. Your contact lens prescription is different from a glasses prescription and cannot use one for the other. Have you had your Eye Exam in the Last Year?